I love the clean, crunchy taste of a fresh, raw bell pepper. But even more, I love the sweet flavor and supple texture when I roast them. Roasting a pepper removes just about all the bitterness, and the pepper's sweetness really starts to come through. The peppers flesh also softens, and while it still has a bit of firmness, the consistency becomes more like that of a tomato. Now roasting peppers can look a bit scary and a little bit intimidating. The best way to do it, has the pepper directly over the fire (yes there is a lot of smoke), and the skin turns completely black as it gets fully charred. At that point, they almost look like charcoal briquettes that are completely inedible. But the reality is you need to get them this charred, so you can easily peel away the skin and get the flesh roasted. When you use the right techniques the process is simple, and the results, delicious. 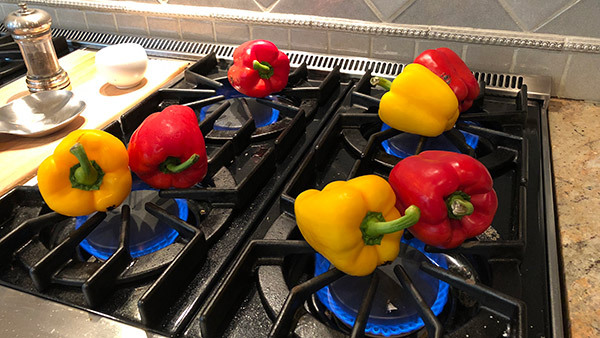 I think the best place to roast a pepper is over the gas flame of your range. However, a grill also works well (it needs to be very very hot) and I've even done it on an electric burner. After another 2 minutes, you'll see the areas that are exposed to the flame have fully blackened (if not, then cook the peppers for longer). Using your hands, and maybe come paper towel, gently rub the burnt skins, and large pieces should easily separate from the flesh of the pepper. Continue to rub, removing and discarding the skin. I prefer to NOT rinse the peppers under water, but some people like that method, and when I've got a particularly messy pepper I"ll do it. It will help remove all the charred bits. Once you' have the skin, seeds and stem discarded, your peppers are ready to eat. I love to use mine on sandwich, with pastas, and even in a roasted pepper bruschetta.